As new and returning students descend on campus like gently falling leaves, the Kwantlen Student Association will be working on a number of initiatives to elect new members, bolster committee meeting attendance, and update the association’s bylaws before changes to the B.C. Societies Act comes into effect this November. Nominations for the association’s by-election will open on Sept. 10, giving students a chance to run for a position on KSA Council. The available seats are for the positions of Academic and Career Advancement Representative, Arts Representative, Design Representative, Health Representative, Trades and Technology Representative, Tech/Cloverdale Campus Representative, and Students with Disabilities Representative. There are also two positions available for Business Representative. The nomination period will close on Sept. 25. Voting in the by-election will take place on Oct. 10 and 11. Caitlin McCutchen, KSA President & VP External Affairs, as well as the association’s women’s representative, says that getting involved in student politics can be a formative experience for students. 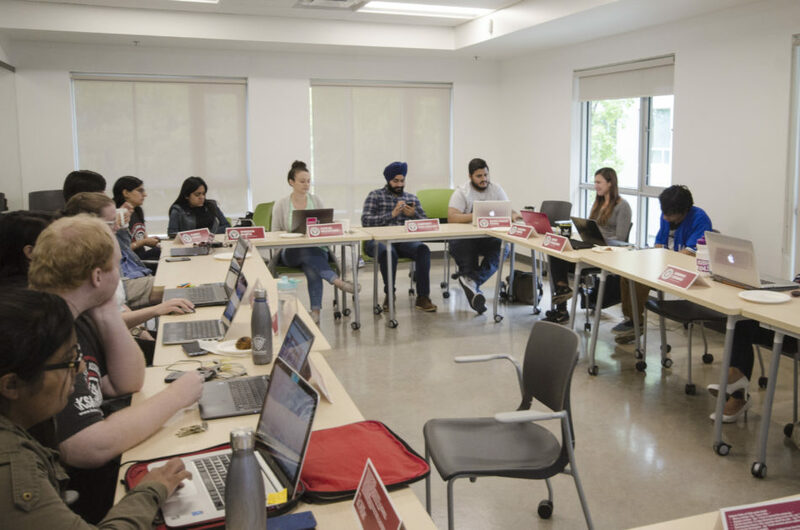 Students who are elected to council are responsible for representing the interests of various constituencies and are involved in event planning, campaigns, policy, and community outreach. Joseph Thorpe, VP Finance & Operations and Queer Students Representative, says that since he joined the KSA in April 2017, it has helped him connect with the student community both at KPU and across Canada. Thorpe included job descriptions in the nomination packages for the executive and councillor roles so that students who run know what will be expected of them if they’re elected. He says that students in faculties like design or health are likely to have heavy course loads and may not be aware of the time necessary to be a member of council. “Even when I was Queer Rep, at first I didn’t realize how much work it was until I actually got on [council],” he says. KSA Arts Representative Natasha Farris, who chairs both the appointments committee and the student life committee, says that a lack of understanding about the responsibilities that come with being appointed to a committee has caused some students to miss monthly meetings because they are either unable or unwilling to attend. The minutes from that meeting also detailed how new members may not have a full understanding of what each committee is responsible for. Committee and Council meetings are held on one Friday per month, generally between 10:00 am and 2:00 pm, which can conflict with some students’ school or work schedules. This prevents some members from consistently being able to attend the meetings. Farris says that the appointments committee and the KSA at large are actively looking at options for removing committee members who are non-communicative and absent from three or more consecutive meetings. By the end of September, all committee member positions will be open and current members will have to to be reappointed to retain their position. This means that most committees will have open positions for students who wish to apply. The KSA will be holding a special general meeting on Nov. 14, at which students can vote on a motion to update the association’s bylaws. In November 2016, a legal framework that not-for-profit organizations had to comply with in order to operate in B.C. called the Society Act was repealed and replaced with the Societies Act. Organizations functioning under the previous act were given two years to update their internal bylaws to account for this legislative change. The deadline for completing this transition is Nov. 28, 2018—exactly two weeks after the KSA will attempt to adopt its updated bylaws. The KSA previously attempted to update their bylaws in accordance with the Societies Act at their Annual General Meeting in March, but were unable to meet quorum. If the members at the special general meeting vote against the motion to approve the changes, or if the minimum quorum of 200 present members is once again not met, the bylaws can not be updated and the KSA will miss the deadline. De Mooy, who has been working with others to update the bylaws, says that it’s vital for the changes to be approved at the SGM. While he is confident that KSA staff and services will continue to operate normally no matter what, he says that failing to adopt the new bylaws would largely impact members of council. As per KSA regulations, which are distinct from its bylaws, council members and student-at-large members of committees are given honoraria for attending meetings and fulfilling their role requirements. KSA representatives are paid $75.00 per attended regular and special meeting of council to a maximum of six meetings, or $450.00 per semester. Representatives are paid another $50.00 for attending standing and special committee meetings that they are members of, to a maximum of five meetings, or $250.00 per semester. Representatives who serve as chairpersons of a committee are paid $75.00 per attendance, to a maximum of five meetings, or $375.00 per semester. KSA Executives are not paid attendance honoraria, but are paid a bi weekly stipend of $1200 dollars. The association is currently looking into whether these stipends will also be subject to termination if the bylaws are not updated. However, the terms of distributing these honoraria are only written in the KSA’s regulations, not its bylaws, which is a requirement of the Societies Act. If the bylaw changes are not approved on Nov. 28, the KSA will lose the ability to pay Council and committee members to attend meetings at a time when absenteeism is already an issue.